“Now more than ever we see the need to organize across borders to tackle corporate global supply chains” that keep workers from retail and farms in low wages,” says Art Pulaski, executive secretary-treasurer and chief officer of the California Labor Federation. Pulaski helped open a day-long conference, “Realizing a More Fair Global Food Supply Chain,” which gathered farm worker activists and food justice advocates to explore farmworker organizing strategies, alliances to support worker rights across the food chain, legal initiatives to ensure decent work and the importance of workers in the advancement of sustainability and justice as our food moves from farm to table. Bader-Blau and Kent Wong, director of the University of California-Los Angeles Labor Center, joined in launching the event, sponsored by the Solidarity Center, the Food Chain Workers Alliance and UCLA Labor Center. 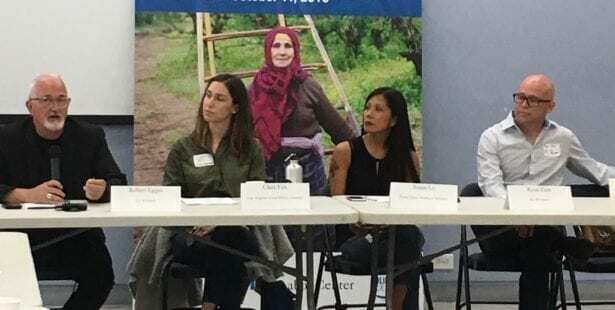 One way to improve worker rights in global supply chains involves workers coming together to demand their rights, and union activists from Mexico, Morocco and Washington state shared their successful strategies organizing farmworkers. Speaking on the first panel, “Build Real Voice and Real Work for Workers,” Ramon Torres, president of Familias Unidas por la Justicia in Washington state, described how he joined with co-workers on farms in Washington state for a two-cent an hour raise in 2013. They went on to champion laws that ensured farmworkers would receive their wages from employers who he estimates engaged in wage theft totaling $850,000. 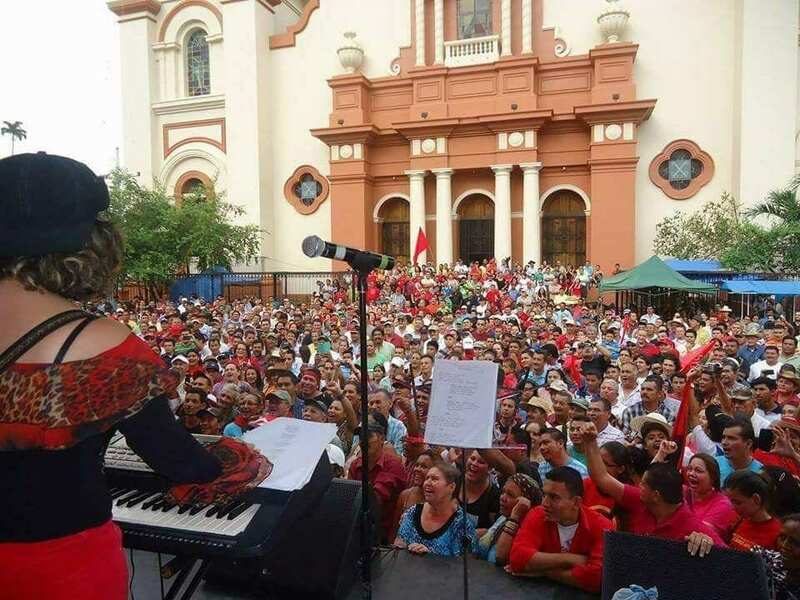 In Morocco, where the Democratic Labor Federation (CDT) organized more than 1,000 farmworkers on a large agro-industrial complex, the union focused on empowering women throughout the process, says Saida Bentahar, a member of the CDT executive committee. “For women working in the agricultural fields, women started to learn about their rights and how to discuss and negotiate,” says Bentahar. “Women also managed to have their voices heard during negotiations” and as a result, they won first-ever health care and education opportunities for their children and can work in higher-skilled, higher-paid jobs previously open only to men. “Now women benefit from many advantages they would not have had without the collective bargaining agreement,” she says. Food justice advocates shared how they incorporate the rights of workers along the global agricultural supply chain during the second morning panel, a strategy session on models of cooperation. “When we say agricultural food chain workers, we mean farm workers, fish workers, meat processing and poultry processing workers, those who truck the food and workers in grocery stores, retail chains, restaurants, and street vendors,” says Joann Lo, co-director of the Food Chain Workers Alliance in Los Angeles. Lo says her organization forrmed as the sustainable food movement took off and consumers began asking how far their food traveled and was it fresh and sustainable—but left workers out of the conversation. “We need to ask: Are the jobs sustainable for workers in the global supply chain?” she says. “The power of procurement most powerful tool we have,” says Clare Fox, executive director at the Los Angeles Food Policy Council. Fox described how her organization successfully moved the LA Unfired School District—which spends $150 million a year on food—to commit to ensuring 15 percent of the food it sources meets a baseline of fair labor, animal welfare and nutrition. The panel also included moderator Robert Eggers, president of the LA Kitchen and Ryan Zinn, regenerative projects manager at the family-owned organic, fair trade company, Dr. Bronner’s. Stop back for more coverage of the afternoon sessions!